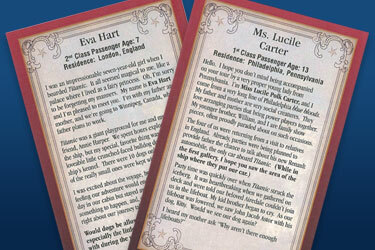 "I was an impressionable seven-year-old girl when I boarded Titanic. It all seemed magical to me, like a palace where I lived as a fairy princess. Oh, I’m sorry to be forgetting my manners. My name is Eva Hart and I’m pleased to meet you." "Hello, I hope you don’t mind being accompanied on your tour by a very proper young lady from Pennsylvania. I’m Miss Lucile Polk Carter, and I come from a very long line of Philadelphia blue bloods."